29-Jul-2015 -- My second confluence visit of the day was to this fairly nondescript point that lies in a clover-filled pasture. I parked about 400 metres away, and walked through the long grass to get to the point. The length of the grass suggested that it had been a while since any cattle had been grazing here. 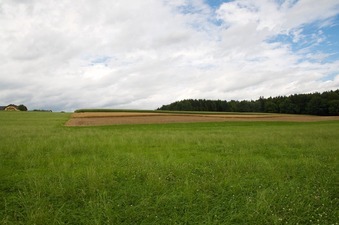 However, a wheat and corn field were visible to the north, alongside farm buildings.